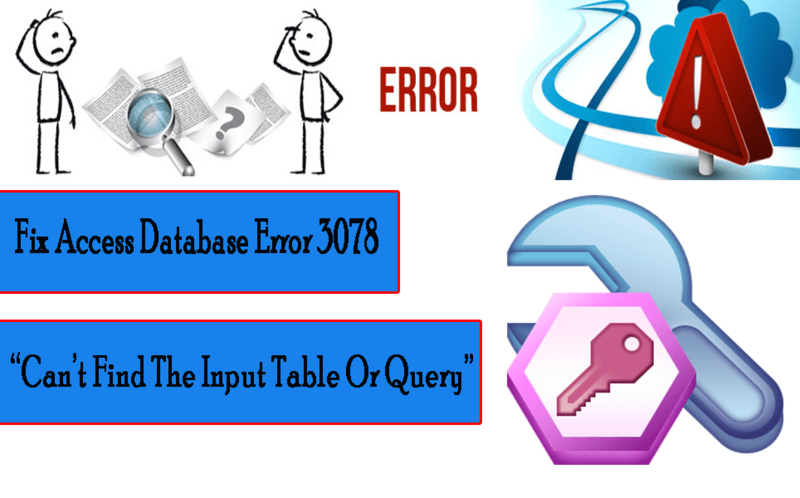 How To Fix Access Database Error 3078 - “Can’t Find The Input Table Or Query”? How To Fix Access Database Error 3078 – “Can’t Find The Input Table Or Query”? Looking for some instant fixes to resolve MS Access Run-time Error 3078: ‘The Microsoft Jet Database Engine Cannot Find the Input Table or query? Well in that case this particular blog will surely gone a help you a lot. As, the following post contains fixes for this Microsoft jet database error 3078. Let’s start a comprehensive discussion on the one of the most frequent error that user faces in Microsoft Access i.e Run-time Error 3078 “The Microsoft Jet Database Engine Cannot Find the Input Table or query”. I have to help somebody who has an application which worked well for a long time. It is an Access application which links directly into an Excell table. If you are also dealing with such an issue in your Access database just like the case mentioned in the above practical scenario. Then just go down to this post and grab complete information about this Runtime Error 3078. Meanwhile the working of Access, you all must have come across various kinds of errors like Microsoft jet database error 3078, Microsoft Office Access can’t find the object, “Unrecognized database format myfile.mdb”, “Microsoft Jet Engine cannot open this file” and so on. Well the runtime error 3078 happens when Microsoft Access fails or crashes while it’s running. This doesn’t mean that the code is corrupt in some way, but just that it won’t work during its run-time. This type of error will appear as an annoying notification on your screen unless it gets fixed. Here are its symptoms, causes and ways to troubleshoot Access Runtime Error 3078. The above error shows that the Microsoft Office Access database engine is unable to find the input table or query ‘|’. So make sure it exists and whether it’s correctly spelled or not. Before proceeding towards the fixes, catch complete information about this specific Access runtime error 3078 cannot find input table. The Microsoft Jet database engine cannot find the input table or query ‘<name>’. Make sure it exists and that its name is spelled correctly. The record source ‘<name>‘ specified on this form or report does not exist. What Are The Causes Of MS Access Error 3078- Cannot Find Table Or Query? The main reason behind the occurrence of this error message is when Access can’t find the table or query in the database, if a link points to an external file which doesn’t exist or if that external file is moved to any other location. Another very common reason of this error is when the deleted or renamed table or query is referenced on the Lookup tab of any other table. Solution 1# Make sure that the table or query exists, so check for it once. But if in case it won’t exist then you can remove all references to it. Or if it is a missing table, re-import or re-link the table. And if it is a missing query, re-import or re-create the query. Often, it is seen that RecordSourceproperty of a form or a report contains a reference to a table or query whose name has changed or that has been deleted. Solution 2# If the query or table exists, then the chances are also that there is a syntax error or spelling error in the references to it. If you found such then correct the syntax or spelling error in the reference. Solution 3# If you are trying to open the linked table, then the source table may not be in the path that you specified when it was first linked. But if you have moved the file, then you need to make use of the linked table manager to update the link information. If the above error leads to corruption of your Access Database Table or Query. Then in that case it’s better to make some faster approach for the recovery of your lost Access Database items. 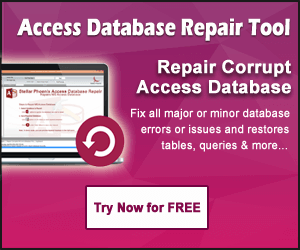 Though there are several methods to repair and fix Access Database corruption like, “Compact and Repair” utility. This inbuilt utility tool creates a backup already and so on. But it’s not recommended to rely on this utility tool as these techniques works to troubleshoot minor corruption issues arises on your Access Database. Though there are numerous MS Access errors, but with this technique you can resolve only few of them. Top 5 Manual Tricks To Repair MS Access Database Files (.accdb/.mdb)…! 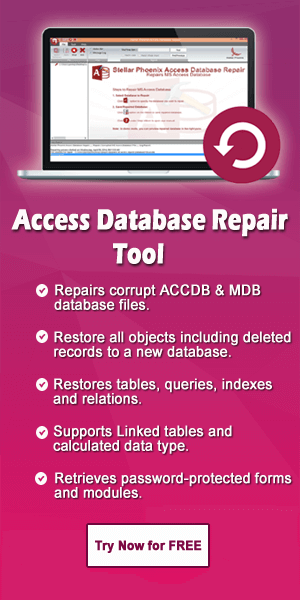 Access repair N recovery software is the ultimate repair tool to rescue when you need an expert solution for major Access database corruption issues. The software is built with an advanced algorithm and is well capable of repairing corrupt MS Access database files of version 2010, 2013, 2016 and older one too. As the software can easily recover, restore and repair corrupted/ deleted/lost access ACCDB Or MDB file without effective its originality in any manner. As stated above that it’s not a big deal to encounters errors in Microsoft Access and thus no such need to get panic when you get one. All you need to do is, look for right method to resolve Microsoft jet database error 3078. And hopefully this blog has helped you in getting such. Besides that if you get stuck in any data corruption issue then try the Access Repair N Recovery software for the genuine recovery and resolving essential data from any sort of corruption. The software is also well efficient to resolve the common errors in Microsoft Access. ← How To Resolve “Access Form Not Updating Table” Issue In Access 2010/ 2013/2016 database?